I will be visiting Geneva for a conference in the last week in October. I was wondering what sort of clothing I should pack for the weather, and also so I don't scream "tourist." I would like to fit in somewhat, so please let me know of any fashion faux pas, or any other culturally sensitive issue with clothing. I will be doing mostly city activities and I suspect it may rain there. Rain is definitely a possibility. Could be anything from a mostly sunny day with occasional rain to several days of downpour, depending on the short term weather situation - checking the weather forecast just before you leave is definitely your best bet. Forecasts are usually pretty accurate and reliable for the next couple days. The site that @LaurentG already linked to is the official Swiss weather forecast, so that's the most reliable source you can get. 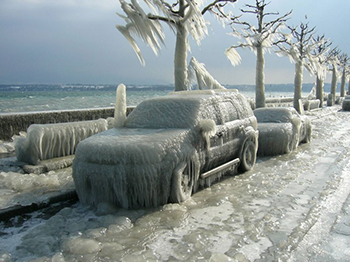 Here's a direct link to the local forecast for Geneva. If you'd like, you can also have a look at the longer term weekly climate outlook (select "Western Switzerland" for the Geneva region). But as stated in the description, these longer term climate forecasts have a rather high degree of uncertainty, I would only use them as a rough indicator as to whether you can expect the weather to be better than the yearly average for october, or worse. Currently we're experiencing a rather unusually nice and warm fall in Switzerland. So if I had to venture a guess, I'd say your chances are good that temperatures will be above average. So based on that, I'd suggest you pack a raincoat or a rain jacket, though there still is a decent chance you aren't gonna need it. Apart from that, as always: layers, layers, layers. I'm currently walking around Bern in a T-Shirt and a sweat jacket or a sweater most days. Towards the end of October, maybe add a light softshell jacket to that, particularly if it gets windy. Wind in particular might be the one thing that's specific to the weather in Geneva. 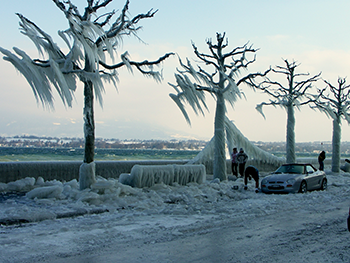 Especially during the later months of the year, there's sometimes a rather chilly northern to north-eastern wind called the Bise (Wikipedia | weatheronline.co.uk), whose effects can be quite pronounced in Geneva. So make sure you've got at least one piece of wind resistant clothing with you. 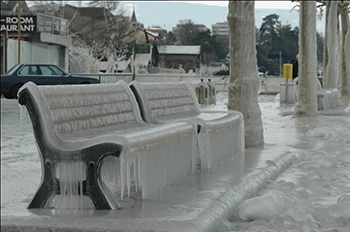 Don't be alarmed, these are not representative of the weather in Geneva. I wouldn't call it a freak occurence, but this phenomenon is rather rare (tough it did happen more frequently in recent years). 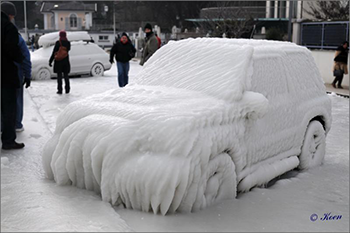 All of these images were taken at the height of winter, usually January or February. It's a result of the combination of the the strong northern wind (La Bise), the lakeside location and freezing cold temperatures. The strong wind turns waves crashing over the quays into a fine mist that freezes instantly and gets layered on top of everything. 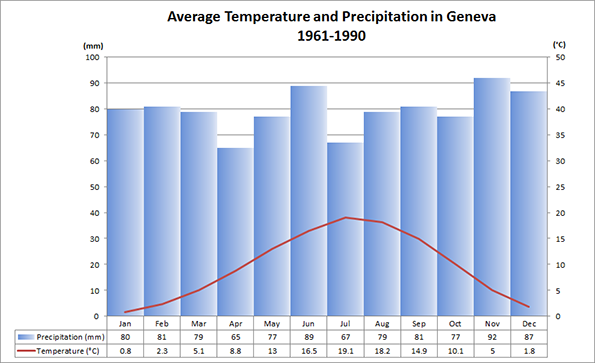 So definitely nothing to worry about in October, but I thought it worth mentioning on the topic of weather in Geneva. As for fashion: I'm definitely not the right person to give fashion advice, but I'd say it's pretty much a non-issue. Casual is fine. And so is everything from chic, business to sportswear. That's for strolling around the city - if you plan to pay a visit to a luxury watch / jewellery store, maybe don't wear a hoody and ripped jeans. Though even then the staff would probably serve you without missing a beat. Culturally sensitive issues: Unfortunately, there is a small but significant group of people that harbour strong negative sentiments towards women wearing burqas in public. It's not a huge issue, and it's much more of a problem in rural areas than in larger cities, but it might be something to be aware of for female readers with an islamic background. But that's really the only thing that I can think of that's even remotely controversial. You could check just before your departure the weather forecast in Geneva. The current weather now (sunny and between 10-20 degrees) is quite nice for the season and you can also expect the weather to change a lot from day to day. At late October it could be also about max. 10 degrees and rainy as the temperature can stay at about 20 degrees or even a little bit warmer. About the clothing, there is in Geneva so many tourists and international organizations that you should not worry about that. With a normal business casual clothing, nobody should look at you. I can just recommend you to be careful about thieves in public area and in public transportation. They particularly look after tourists and since you don't know the city, you will look as a tourist with any clothes. When I visited Switzerland, the wind was chilly and it was raining. Personally, not the best combination. Just remember to bring a jacket with you to fight it. Check the weather in advance too. In general, I don't think the Swiss are that into fashion. If you don't want to stick out, don't dress like an Eskimo and don't wear brands that stand out. You would know by looking at it. Even if you're at a conference HAVE FUN! Switzerland is really an amazing and beautiful place. Not the answer you're looking for? Browse other questions tagged switzerland clothing geneva or ask your own question. What clothing should I bring to Chicago for New Years' Eve?